For this piece, the goal here is to create a design using exclusively fonts. The concept here is very simple, a classroom, but bring restricted to only fonts made this difficult. 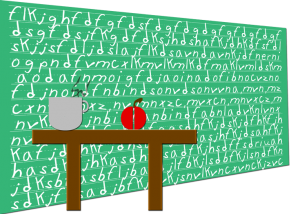 I used KidTYPERuled as the font for the blackboard. I also gave the board a perspective with the transform tool. For the apple, coffee mug and coffee steam I used letters, rasterized them and used to warp tool to manipulate the shape. For the table, I used two letter “Ts” and made the tracking to bring them closer. Certainly not my best design, but an interesting challenge given the restrictions.